Less stress for referees — RandallAnthony Communications Inc.
We’ve all been there: at the edge of our seats and engrossed in a game when the referee’s whistle interrupts the action. What comes next could be greeted with cheers or groans, depending on whether the call is in favour of our team or the opposition. “Any call an official makes typically pleases half the people,” says Kim Dorsch, a professor in the University of Regina’s Faculty of Kinesiology and Health Studies. “I was watching a [football] game last night and sure enough, people got riled up when the official didn’t call a penalty – and this non-call led to a touchdown. 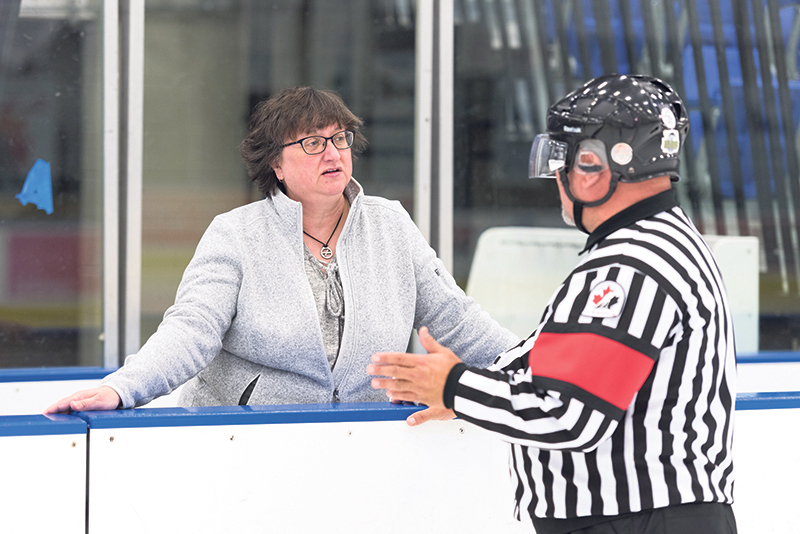 Dr. Dorsch, whose research in the field of sport psychology examines the psychological stressors and coping styles of sports officials, has found that enhanced training can lead to better outcomes for hockey officials. The first step toward alleviating what Dr. Dorsch calls a “crisis in officiating” is understanding the types of stress referees commonly face. “There are two main categories of competition stressors – one is the fear of making mistakes and the other is the fear of abuse, which could be verbal or even physical abuse coming from players, coaches or spectators,” she explains. All these elements can impact the performance of officials, and they can also lead to resignations. Dr. Dorsch has found that referees encounter different stressors as they move through the various levels of officiating. “The fear of making mistakes is perceived as the greatest stress factor, even greater than the fear of abuse, especially for referees who are just starting out – it causes officials from many sports to retire,” she says. In partnership with the Saskatchewan Hockey Association, Dr. Dorsch’s team worked with hockey referees to evaluate the use of NeuroTracker, an innovation developed in Montreal, which aims to enhance mental performance by challenging users to track multiple targets moving dynamically in 3D space. By proving that more can be done to prepare officials for their challenging role, Dr. Dorsch’s research has broad implications, not just for hockey but most competitive sports. Compared to professional athletes and coaches, referees typically have a low profile. They simply don’t receive the same attention, support or compensation from sports organizations, and Dr. Dorsch aims to shift that balance.